This year it was mulch. It’s that time of year again. The time when my wife orders a huge pile of compost and dirt, has it delivered to our front yard and then decides where this fresh earth is needed most. Of course, all three cubic yards of this will be moved into the ever-expanding vegetable and fruit garden she is constructing. It began a couple years ago with one raised-bed in our backyard, and now takes up our entire property. 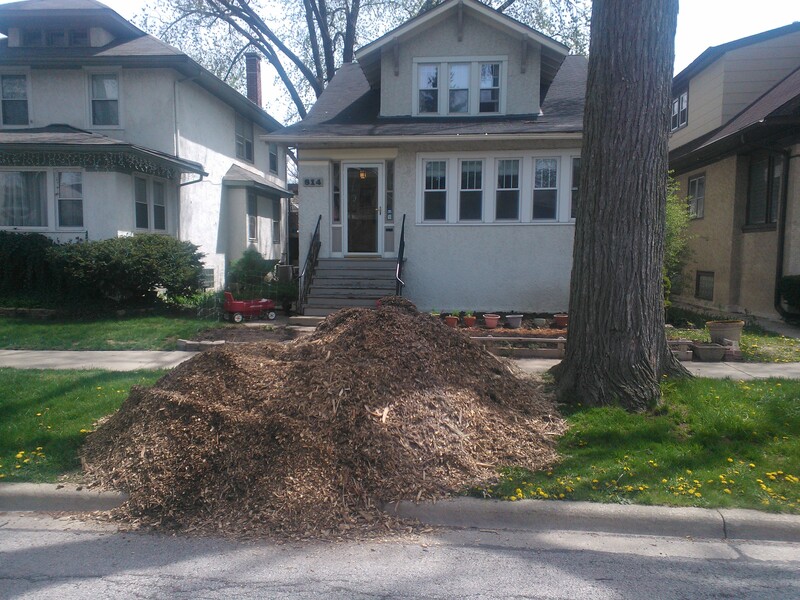 Granted, we live in NE Oak Park, so it is not like we have a huge yard, but covering even such a moderate area in fresh compost/dirt can be quite a chore using only a shovel and a red children’s wagon (we don’t have a wheel-barrel). It is a physical job; your hands get dirty, your fingers get calloused and your arms and back ache. Though this doesn’t sound like an enjoyable task, it actually is quite fulfilling. I think many people love the ‘good’ muscle pain of a hard day’s work. To me however, this job is enjoyable for another reason. The question I have been asking myself the last week is why? Why do I enjoy this seemingly mindless chore? Well, I think I may have a reason. It’s the ‘natural’ way to work. In his brilliant 1967 essay “Work, Time-Discipline, and Industrial Capitalism”, the English historian E.P. Thompson illustrated how pre-industrial, agricultural work was ‘task oriented’. This was very different from our modern way of working, in which any down time is usually thought to be ‘wasted’. The modern notion of time really began with the industrial factory where time was to be ‘spent’ specifically and exclusively for production. Any time ‘spent’ otherwise was time that was lost, and hence, profits. This was new. It was not called the Industrial Revolution for nothing. Obviously, most Americans don’t work in factories, but our modern style of labor still is based upon this industrialized ethic. I learned this at 19 when I worked at a certain, infamous fast-food chain. It was constantly reiterated in that job if you had “time to lean, you had time to clean.” In other words, don’t rest (or think), just work. A grateful Scene, and ready for the Barn. And we for carrying all our Force employ. And rattling Waggons thunder o’er the Ground. And loud Huzza’s proclaim the Harvest done. My labor of moving dirt from one place to another in my small yard is of this nature. I feel like proclaiming a “loud Huzza” as I finish this task. I am in a rather similar state this Summer as I have been returned to “hourly” work for this term in the RMU Library, where I must stay until 8pm, when I have grown accustomed to leaving work when work was done (sometimes earlier, sometimes later). Work tied to a task, rather than a clock does seem more ripe for the sense of accomplishment. I am in a similar position in that I am an “hourly” worker in the RMU library this term, staying until a specific time, instead of at the completion of my work. Task-oriented work does seem to offer more opportunities for job satisfaction in that the thing accomplished feel good. Great. Perfect combination of rural and urban.